I stumbled across Captain Jack Sparrow as he was recruiting a crew of rather small people for some dubious cruise to a far away land. I’m not quite sure what he thought of me with my camera, but his mate seems pleased enough to see me there. 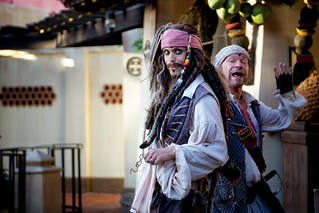 Perhaps he thought I was there to pilfer his rum.